“Washington is Hollywood for ugly people,” the saying goes. The manifest connection between the two has been particularly pronounced in the promotion of CBS’ new television show, “Madame Secretary”. Washington’s denizen’s feel a kinship with actors, who practice a craft of role-playing much like their own, and, being so self-absorbed, they like nothing better than stories about themselves. Politico, an influential political journalism organization that normally focuses on the inside workings of politics, devoted almost 400 words yesterday to last night’s debut of “Madame Secretary”. The coverage included lengthy comments by actor Tim Daley, who plays the husband of actress, Tea Leoni, who plays the Secretary of the State. It also included a link to a 5-minute video “First Look” at the show and comments by Leoni on playing the Secretary of State character. 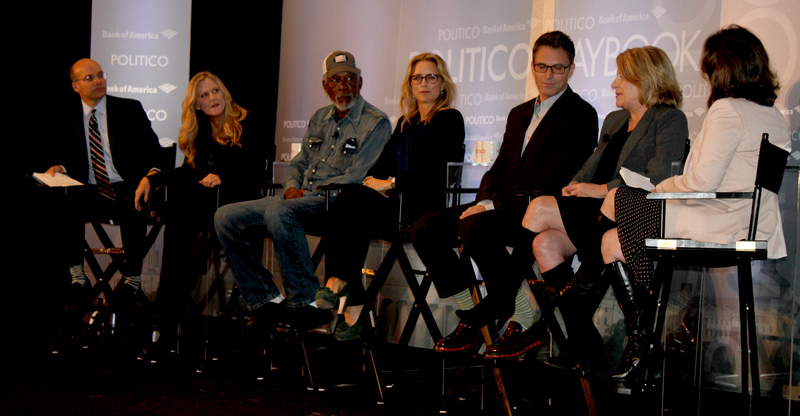 This was preceded by an almost 300 word item on Sept. 19, inviting Politico’s audience to a high-powered luncheon at the Hyatt Regency on Capitol Hill with the stars and executive producers of “Madam Secretary.” There, Mike Allen, author of the Politico Playbook, and Maggie Haberman, a Politico reporter, would talk with Téa Leoni, Tim Daly, and Executive Producers Barbara Hall, Lori McCreary and Morgan Freeman. Allen also noted that National -security influencers packed the theater at the U.S. Institute of Peace on Sept. 18 to see the premier episode, with an introduction by Freeman. Guests munched on crab cakes, sushi, grilled shrimp BLTs and crispy wonton cones – with Georgetown Cupcakes after the show. Some of the government-media complex who attended the star-studded schmooze-fest included: CBS TV journalist, Bob Schieffer, (who also had a cameo in last night’s show); Huma Abedin, a long-time aide to Hillary Clinton married to the infamous former Democratic Congressman Anthony Weiner; N.Y. Times columnist, Maureen Dowd; Nick Merrill, press aide to Hillary Clinton; and Jen Psaki, Deputy Communications Director and Deputy Assistant to President Obama. I’m sure they all enjoyed themselves immensely, because for politicians, political junkies, the media and actors, it’s all theater, all razzle-dazzle, as Billy Flynn, the silver-tongued lawyer in “Chicago”, so aptly put it. This entry was tagged Anthony Weiner, Barbara Hall, Billy Flynn, Bob Schieffer, Chicago, Huma Abedin, Jen Psaki, Lori McCreary, Madame Secretary, Maggie Haberman, Maureen Dowd, Mike Allen, Morgan Freeman, Nick Merrill, Politico, Razzle Dazzle, Tea Leoni, Tim Daley, U.S. Institute of Peace. Bookmark the permalink.